I have based this page on the "List of figures animals and birds" in section 13 of Royal Crown Derby by John Twitchett and Betty Bailey, which they quite rightly refer to as "sadly incomplete" Unfortunately as the figurines are not marked with pattern numbers I have had to rely on the limited information available to include old brochures where the numbers are given. Numbers F475, 476, 479, 481, 488, 501, 503, 526, 527 and 549 are omitted from their list. As the authors of Royal Crown Derby would have had the benefit of full access to the Company Archive I can only assume that the relevant records are missing. The task is further complicated by the fact that some of the figurines date from a much earlier period (1880's according to Twitchett and Bailey) and were re-introduced. I have also seen examples of these earlier figures marked with a King Street back stamp. No doubt a more complete picture will become available with further research. This version of Oliver Twist has the factory mark used 1954-65 and is therefore a much later re-issue of a figurine which was probably first produced in the 1880's. F312 also appears in King Street company history dated C1935 (No 20 Derby Peacock) and was therefore presumably originally manufactured at King Street. The image of Anna Ahlers is reproduced here by courtesy of Stride and Co Auctioneers and is attributed to Tom Wilkinson. The Fishwife is marked as Sculptured by Miss M R Locke. Skiing Girl is also credited to Miss Locke by John Twitchett and Betty Bailey but the example above is not marked as such. John Twitchett and Betty Bailey credit Miss Locke with the "lady reading a book" F484 figurine but the example above has only the usual factory mark. The fixed expression and hand placed on the book might indicate that she is reading Braille but further research is required. Peter Pan is marked as being by Miss Locke. 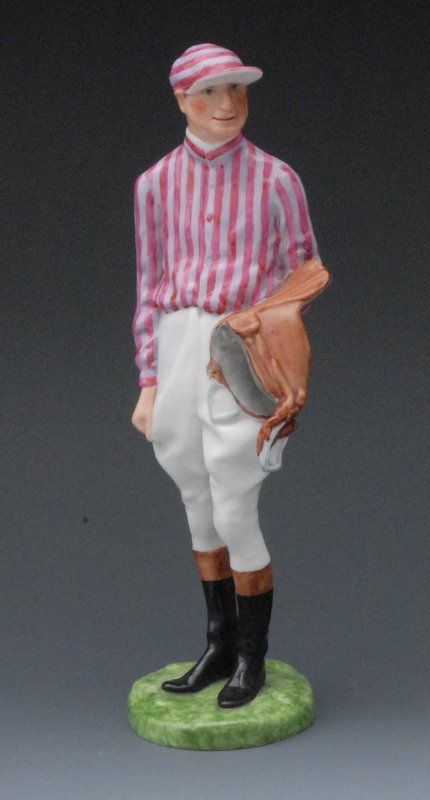 The image of the Jockey is reproduced by courtesy of Bamfords Auctioneers and Valuers Ltd. This example of Conquest is not marked as being by Miss Locke, but I have seen other examples which are. I have shown it as F488 as this would seem likely, but it is not listed as such. Festina Lente or "more haste less speed", was apparently made in two sizes and is described as "Donkey with Panniers" by Twitchett and Bailey. In 1947 Arnold Mikelson, a woodcarver originally from Latvia and exiled to Germany during the war, came to the attention of Harold Taylor Robinson and was employed to produce a new range of figurines, of which the greater part are shown below. Most of the figurines F491 - F560 are attributed to Arnold Mikelson by Twitchett and Bailey. The following are unattributed - F491, 492, 494, 496, 497, 498, 500, 502, 557, 559, 561 and 562. The Sitting Alsatian figurine is known to have been commissioned by Company Director Colin Osborne from Barry Pittar, a freelance sculptor based in London who advertised his services in the Pottery Gazette and Glass Trade Review. Not every figurine in this section can therefore be attributed to Arnold Mikelson but further research is required. I have allocated F503 to the Alsatian Figurine although it is omitted from the list published by Twitchett and Bailey. I have also seen a version of F517 similarly painted but marked "Jackdaw" by error. So far the figurines have been representations of birds and animals indigenous to the UK, but the Cockatoo marks the beginning of a series of larger more exotic birds of which some were doubtless aimed at overseas markets. The Pheasant was restored by Alan Franklin Restoration http://www.ceramicrestorers.com/. The Owl figurines are 10" tall and therefore rather larger than version F551 shown below measuring about 6". The models are the same just painted differently. The Barn Owl version is marked "CJ" for C Jackson and has a date cipher for 1970. The two parrots (F557) are shown here as a pair but were purchased separately and are differently coloured. However it would seem likely that they would have been available as a matching set. 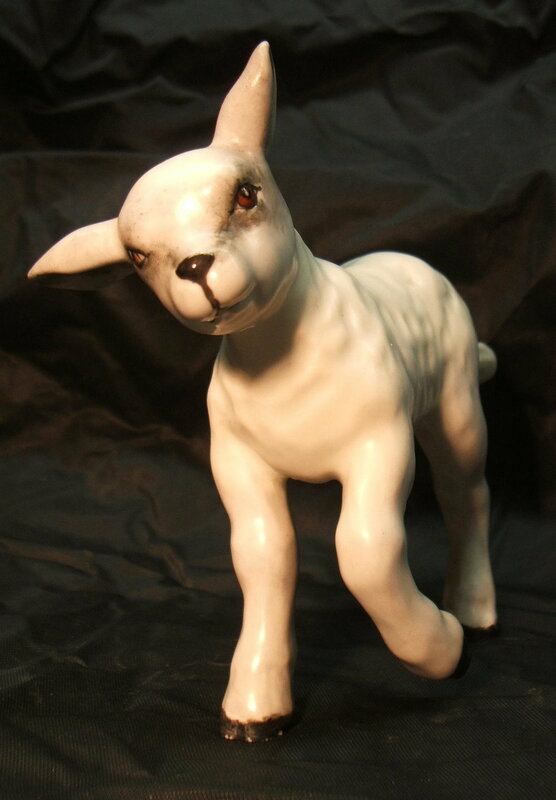 They are designed to be wall mounted and are perhaps Royal Crown Derby's upmarket response to the flying ducks and other wall plaques which Beswick had found so popular. Redstart F560 is the only other bird plaque of which I am aware to date. Hornbill and Owl Salt and Pepper. Also found as sets with two owls or hornbills, and with green painted bases. Attributed to Arnold Mikelson by Twitchett and Bailey. Arnold Mikelson left the factory to take up a position in Canada in 1954. A series of twelve figurines designed by Phillip Robinson and modelled by Edward Drew who was appointed to replace Arnold Mikelson. The "Flower Seller" and "Fruit Seller" figurines appear to be reworkings of older models which appear in the King St catalogue, but PR3-12 are new. Characterised by a sense of movement, the figurines are designed to be viewed from several angles. 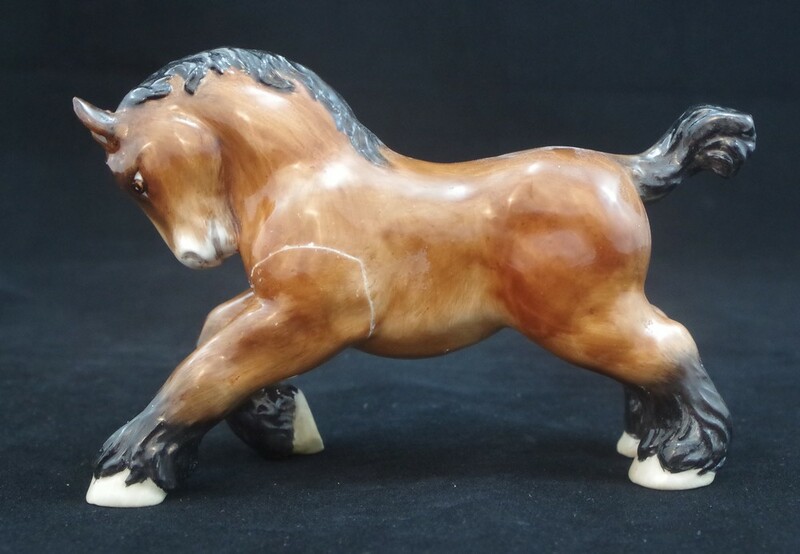 Figurines PR13-28 are listed in John Twitchett and Betty Bailey's book on Royal Crown Derby, but so far I have not seen any examples and I suspect that they never went into production or were withdrawn soon after. 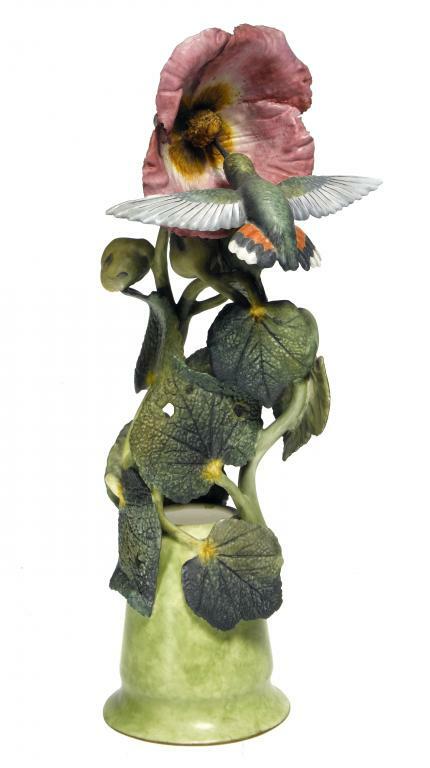 Two figurines designed by Phillip Robinson. "Vanity" is 6 inches high, "Beau Brummell" 7 inches. The Beau Brummell figure above is marked as a seconds and is not fully decorated. Matador and Bull designed by Phillip Robinson and Modelled by Edward Drew. Signed by B Riley who is listed as working at the factory from 1960-64. Rufens Hummingbird by Edward Drew. The image is reproduced courtesy of Bamfords Auctioneers and Valuers Ltd. The Beefeater figurine was made specially for James Leather Ltd., later Leather and Snook of Piccadilly, London. It has a date cipher for 1957. It is number 14 of a limited edition and is signed by J Gould. The pike is of painted wood. Seven figurines originally produced in the 1880's and most probably all modelled by Herbert Warrington Hogg (See Twitchett and Bailey Royal Crown Derby revised edition antique collectors club 1988 Page 63). Re-issued in the 1930's, they are numbered in accordance with their "List of figures animals and birds" in section 13. Dr Syntax (Here shown minus his walking cane), Don Quixote, Friar Tuck, Robin Hood and Robinson Crusoe all have factory marks for 1932. Little Dorrit has a date cipher for 1933. I have no number for "Shoeshine" (It does not appear in Twitchett and Bailey's list) and there is no date cipher included in the factory mark. This example is marked "WEM" for William Mosley dating it between 1935 and his reported death in January 1956. Dr Syntax figurines were also manufactured at King Street and figure numbers 3 (Syntax Sketching) and 4 (Syntax up Tree) are illustrated in that company's history/catalogue dated C1935 which I presume was produced just before the factory was taken over by Royal Crown Derby. Other King Street Syntax figures are included in a King Street price list which appears in Royal Crown Derby by Twitchett and Bailey (page 25 revised edition). In addition to the two illustrated also in production were "Syntax on Horseback", "Syntax at Calais" and "Syntax Walking". A photograph of Syntax Walking C1920 is included on the same page. The Royal Crown Derby version is very similar apart from the addition of a head scarf, the position of the tree stump and the fact that the walking cane is held in the opposite hand. Two pig figurines to which I can find no reference. There is no date cipher on the first pig whilst the second dates to 1955. It would appear that the Landrace is an American breed, and as this piece was acquired from the US from a seller who had a batch of these on offer, I can only assume that it was a special order, perhaps intended as prizes.